EF will automatically fill in the data access code for the developer and simplifies the process of linking tiers together. If you don't already have it on a project solution, you can get it from NuGet (in VS 2013: Tools > Library Package Manager > Manage NuGet Packages for Solution). 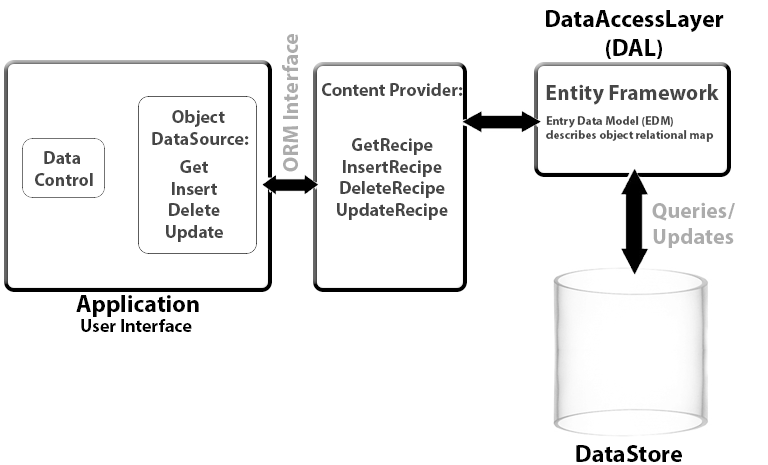 NHibernate does a similar linkage for .NET (Hibernate is the Java counterpart), however Entity Framework may be simpler/more compatible with everything because it is a Microsoft add in for an already fully Microsoft environment. It provides easy management of the following relationships between data tables: "one to one", "one to many", and "many to many" (see following screenshot). And of course, you can use the CRUD (Create, Read, Update, Delete) operations on the database. 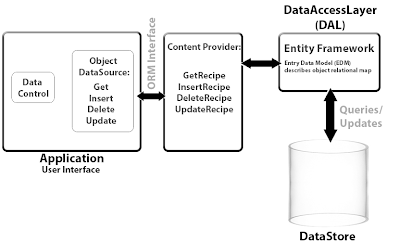 Entity Framework is part of the ADO.NET technologies set and allows LINQ to be used with SQL, DataSet and Entities. As of June 20th, the latest version is out which is EntityFramework 6.1.1.